Each and every month we feature top blogs we’ve come across recently. And for May, we have a fresh batch of blogs for you to check out. This month’s blogs made the list based on social promotion, SEO, writing style, more. Make sure to visit these blogs and bookmark your favorite posts. Let’s get into it. Want to keep visitors stuck to your content? Then you need a top-notch blog design. Because an appealing blog combined with great content turns visitors into subscribers. 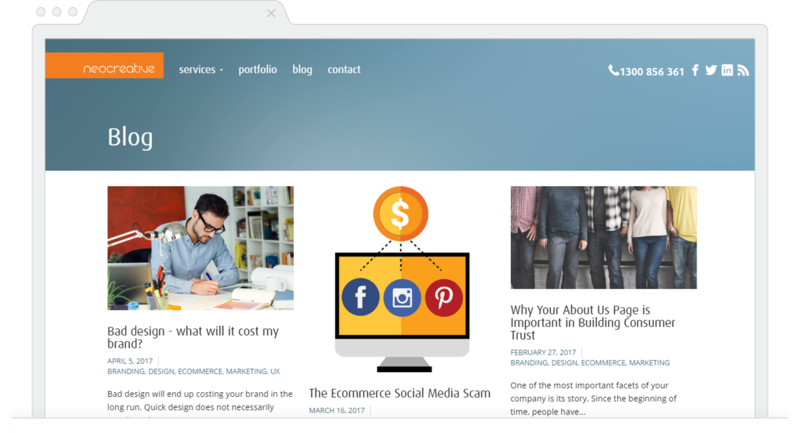 When we came across the Webkick blog, we knew we saw a blog design winner. Their simple style and great topics make any visitor want to stick around. 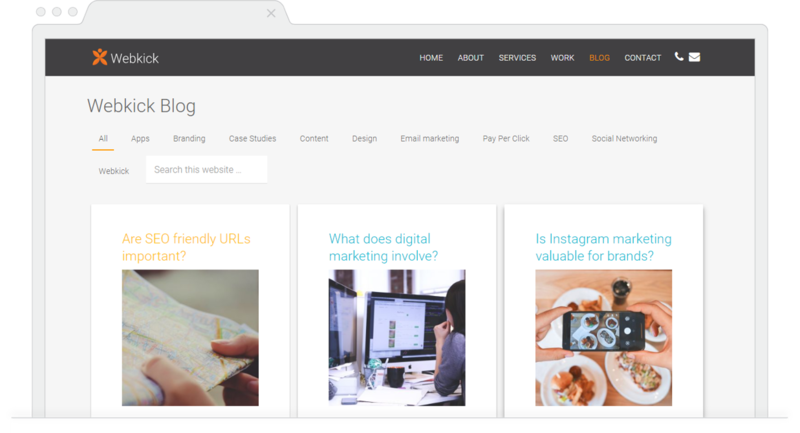 Pro Tip: There are a few tricks of the trade when it comes to blog design. For one, aim for consistency. Maintain the same look and feel seen across your site. Also, simplicity is key. A blog requires visitors to think. So keep your design simple and airy, helping visitors focus on the ideas you discuss. SEO can be complicated. But the idea behind it is simple. Increasing your search engine rank drives more quality visitors to your site. And a blog is the perfect means to facilitate that. This month we saw the Neocreative blog hit an SEO home run. The search-friendly blogging drives traffic to their content. And these are quality visitors, actively seeking topics that Neocreative has the answers to. Pro Tip: If you want to write SEO-friendly blogs, you have to start with the basics. This means on-page optimization. From there, you can build page authority through link building, forum posting, and other off-page SEO techniques. Your blog readers are unique. And because they’re unique, you have to cater to different tastes. Enter author diversity. Author diversity means your blog uses a range of content creators with unique writing styles. 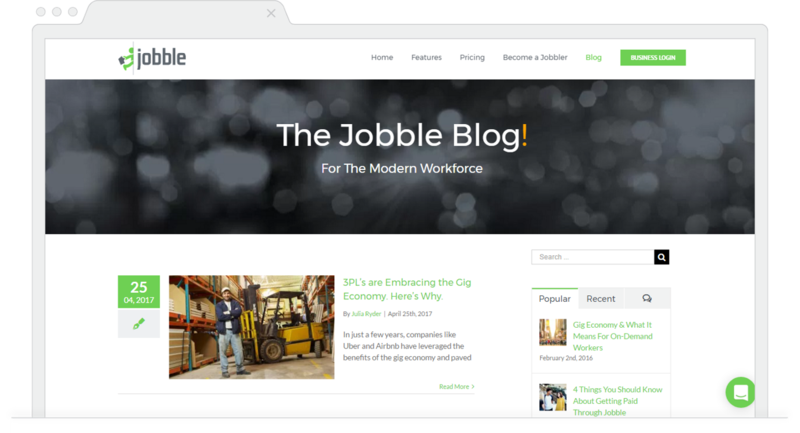 One blog that knows the power of authority diversity is Jobble. They use multiple authors to produce content, helping them reach different audience segments. Pro Tip: Need blog contributors? Ask colleagues to contribute to the blog. As a content marketer, you can use their knowledge to create content. Where you come in is at the editing and promotion phase. You can also look outside the organization and use guest bloggers. These bloggers know the ropes and bring expertise to your content. Sharing your content across social networks is a must-do these days. Because it can drive serious traffic to your site when done right. Not only that, but high social shares show industry influence. Making your blog a thought-leader. 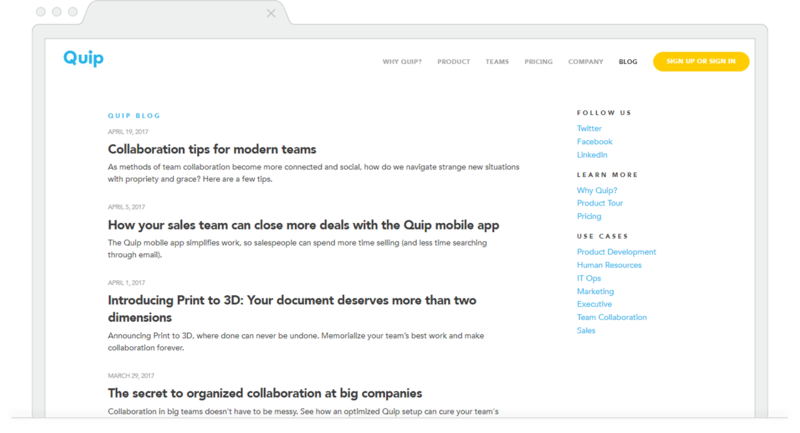 One blog we saw this month generating a ton of social shares was the Quip Blog. Their social promotion strategy drives visitor traffic and builds brand authority. Pro Tip: Social promotion is a must-do. But you have to target your promotion. Share your content on platforms that make sense for your business. If you’re a B2B business, LinkedIn and Twitter would generate the best results. For a consumer-focused blog, platforms like Facebook or Pinterest are a good bet. A focus on trending topics within your industry is good for two reasons. The first is that you’re catering to your readers. Because your readers are in a specific industry, they’re looking to you for knowledge. The second is that it shows you know what audience wants. Meaning you’re ahead of the curve. This establishes you as an industry thought-leader. 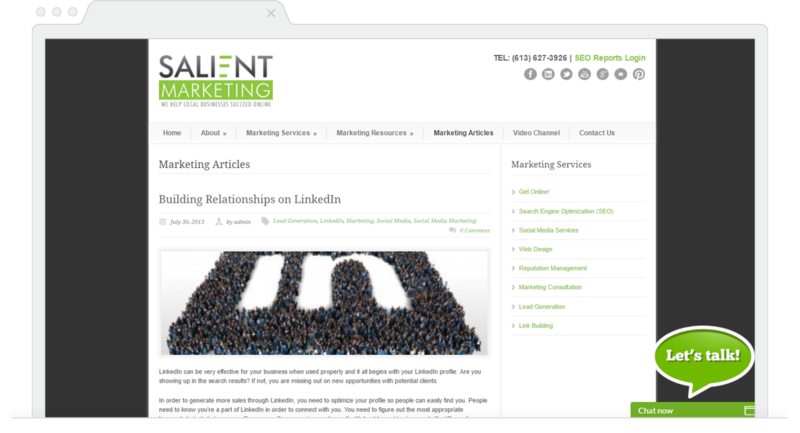 One blog we saw this month hit home on content alignment is the Salient blog. They focus on topics they know readers want. Pro Tip: Are you focusing on trending topics? One way to find out is to look at other blogs in your industry. But not just any blogs, you want to focus on industry leaders. From there, you can see how well-aligned your content is with theirs. That does it for this month’s blog round up edition. Make sure to check out these industry blogs and bookmark your favorite content. And don’t forget to check back next month to see if your blog made our monthly roundup list!